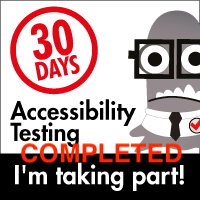 The Ministry of Testing has declared that May should be "30 Days of Accessibility Testing". As in the days of yore when I used to take on these challenges and blog regularly, I'm in the mood to get back to doing that. 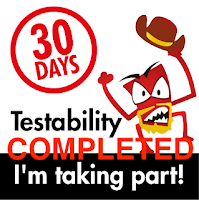 Therefore, I am looking to write a post every day around this topic and as a way to address each line of their checklist. Today, let's look at #2. 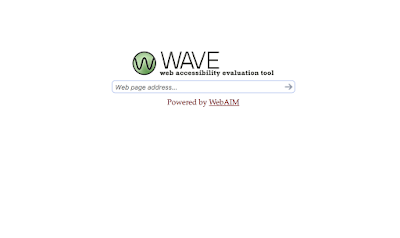 Almost everyone that starts with Accessibility testing at some point early in their learning comes across WAVE. There are lots of good reasons why. First, it's a standalone page. Second, it's simple to get started. Just go to the site, put in the URL and Submit. Ahh, but that's just the beginning :). Let's try an experiment. How about we choose a page that's relevant to me? Heck, why not this blog? What would happen if I did a scan for http://mkltesthead.com/? Looks like the answer is "there are a lot of issues" with my blog as it relates to Accessibility. It looks like most of the images being displayed do not have "alt" tags. Lots of redundant links. This is a blog, so that may well be unavoidable, but it's still worth looking at. In this case, the redundant links are the tags I use for each post. Repetitive? Yes. Necessary? Arguably, yes. Contrast is low (I admit, I like the layout of my site, but it's a good bet that for color blind individuals it may well be hard to read). I hear you all. You are thinking "OK, that's great, but so what?" Well, now I have a clearer idea of elements about my site design that I might want to change. Some I will have a hard time changing as they are part of the Blogger platform and templates, but many I can change since there are elements of the template that I can modify directly. 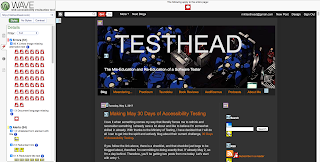 Redesigning my blog is not part of today's challenge, but just by doing this little bit, I'm seeing areas that I can directly control and changes I can personally make that can enhance or better the user's experience as Accessibility is concerned.